Ghost Ranch is a 21,000-acre (85 km2) retreat and education center located close to the village of Abiquiú in Rio Arriba County in north central New Mexico, United States. It was the home and studio of Georgia O’Keeffe, as well as the subject of many of her paintings. The conference center and lodgings at Ghost Ranch are run by the Presbyterian Church but open to the general public. 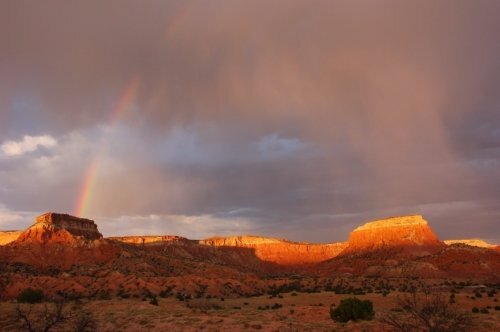 Ghost Ranch is part of Piedra Lumbre (Spanish, “Shining Rock”), a 1766 land grs through the canyons and gorge, providing a drought-resistant source of water for life to thrive. Now, the ranch is used as an educational and retreat center, where over 300 classes are offered each year.